One of TSR's many superb and prolific artists - Clyde Caldwell. 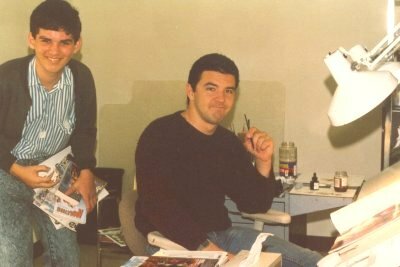 He worked in the same room as Jeff Easley and Fred Fields. 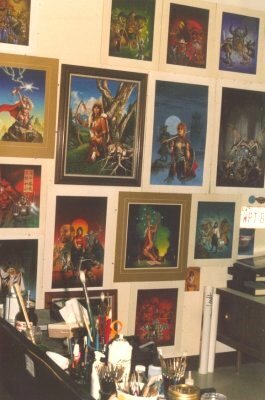 Originals of his famous works line the walls behind him - eg: at my head level, one can see the covers of the 1987 Dragonlance Calendar, the first Dragonlance module: Dragons of Despair, and one installment of Greyhawk's Mika novel trilogy. When painting, the artists receive two short descriptive sentences which they must paint while their imaginations run wild. Further originals of Clyde Caldwell's magnificent work. Those on the top row were used mostly for D&D Gazeteers of Mystara. The row below holds a large work of a female ranger from Dragon magazine #94, the cover of Azure Bonds, and the cover of the Forgotten Realms Spellfire novel. The bottom rows hold miscellaneous paintings of lesser significance. 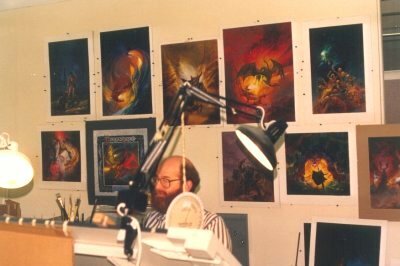 In the same room, another TSR artist, Jeff Easley was found at work with originals of several past creations arrayed on the wall behind him. From left to right, the top row shows a painting of Kitiara from the Dragonlance world, the front cover of the first printing of the AD&D Second Edition Dungeon Master's Guide, the front cover of the first printing of the AD&D Second Edition Player's Handbook, a much reused painting of to dragons fighting, and the front cover of the Magister Forgotten Realms game accessory. From left to right, the bottom row shows a magical idol from a desert region of the Forgotten Realms as featured in the 1989 calendar of that world, the front cover of the 1988 Dragonlance Calendar, the front cover of the Oriental Adventures Forgotten Realms boxed set, a painting of Raistlin fighting Fistandantilus from the 1988 Dragonlance Calendar, and the front cover of the AD&D First Edition Greyhawk Adventures hardback rulebook. 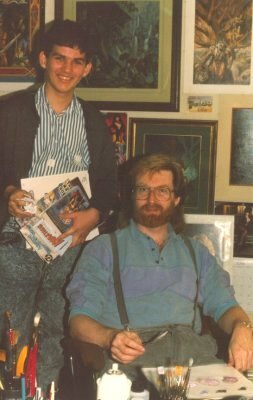 At the time of my visit, Jeff Easley was working on the front cover of the then upcoming Spelljammer (AD&D adventures in outer space) boxed set. 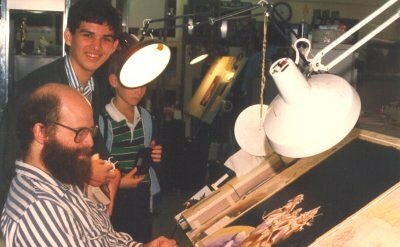 Nearby are various sketches and photos that he and all artists make before painting. Many of the people depicted in these fantasy paintings are based on real life models. Then newcomer to TSR, Fred Fields - in another part of the artist's room. At the time, he was known mostly for his work on the front covers of various issues of TSR's module magazine - Dungeon.